Starring Gong Yoo, Lee Dong Wook and Kim Go Eun, tvN’s December drama ‘Goblin‘ is rumored to be 2016’s best drama for the second half. Just on it’s first broadcast, the drama broke all records for the highest viewership ratings, which were previously held by the first episode of Reply 1998. Clearly, the drama is on a roll. Written by Kim Eun Sook, the drama is a historical fantasy that gravitates around the sad and tragic tale of the Goblin and his bride. Kim Eun Sook has many hit-dramas to her penmanship, including ‘Descendants of the Sun‘, ‘The Heirs‘ and ‘Gentleman’s Dignity‘. An immortal Goblin and an amnesiac Grim Reaper end up living under the same house. They are fatefully tangled with one human girl, who turns out to be the Goblin’s bride. Only the Goblin’s bride can end his sad and immortal life and bring peace to his soul, but what happens when the Grim Reaper is also looking for this girl, for escaping death long ago? The story takes it’s turn being both mysterious and comical. An immortal Goblin who collects antiques and moves towns and cities often. A Grim Reaper who has to eat and live like a human, only to take away their lives when death comes looking for them. Both these men, though they hate living with each other, find themselves living under the same roof and get involved in the life of one human girl, that happens to be the Goblin’s bride. Gong Yoo, the infamous grows-handsome-like-fine-wine actor plays the role of the Goblin. He has shown his charisma in several roles including his legendary one as the male lead in ‘Coffee Prince‘ and then ‘Big‘. 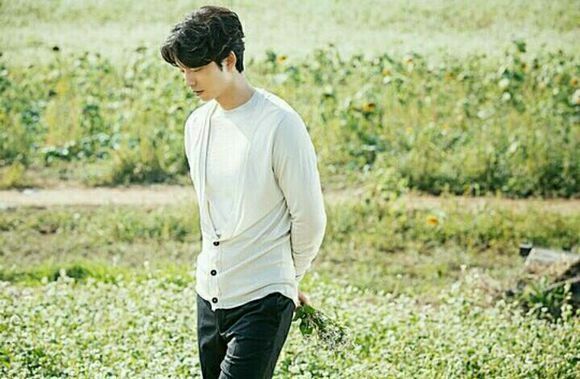 Gong Yoo has a charm that borders between young and foolish, and a gentlemanly elegance. He channels both, for his role as the 900 year old Goblin who just wants to die peacefully after all these years. Truly, the fate of remembering the death of your loved ones, is a tragic one. But one he must bear. The only one who can help him escape this fate is his bride, who, in all honesty – is having it worse in life. Kim Go Eun who recently made news for her awkward but adorable role in ‘Cheese in The Trap‘ plays the role of Ji Eun Tak, the girl who can see ghosts. As the Goblin’s Bride, she has her work cut out for her. She constantly encounters ghosts and other-worldly beings that she doesn’t quite want to, and lives like a modern Cinderella. After her mother’s death, she had to rough it with her aunt and she’s just looking to be a little happier in life. Even if it means getting married to a Goblin. Lee Dong Wook plays the role of the Grim Reaper. Personally, we would have never expected Dong Wook to take on such a sardonic and melancholic role. He is much more suited for the sweet oppa-next-door roles. Maybe, that is precisely why he is shedding his usual cute charm and slipping into the ‘grim’ role of a Reaper. An amnesiac reaper, he just wants to find the little girl who escaped death because the Goblin took pity and meddled in a human’s life. Yoo In Na and Yook Seung Jae (of BTOB) play minor roles as the Grim Reaper’s love interest and the Goblin’s nephew respectively. Though they have their own story lines, not much has been revealed as of yet. With great precedents like ‘Descendants of the Sun’ and ‘The Heirs‘ the write Kim Eun Sook just keeps getting better with her story deliverance. The story of the Goblin has been shrouded in myth and mystery even before the release of the drama. The trailers include short clips of the characters describing how their lives changed because of the Goblin, but not why and the details that follow it. (You can watch a compilation of all the trailers here. )The first two episode, though deliriously long, only show us a minor preliminary glimpse into the eccentric story. From what we have observed, the drama’s strengths clearly lie in it’s story telling. It is interspersed, quite rarely, with the character’s most innermost thoughts. The predictable characteristic of most K-Dramas is starkly missing, which is going to keep it interesting. The OST for the drama was recorded by Punch and Chanyeol (of EXO) and has been used brilliantly. The mystic and slow snow-ball increase of the OST gives the drama, the punch it truly deserves. All in all, this drama has delivered much of it’s promises just in the first two episodes. From it’s story and the actors involved, we are already excited for this drama. Ofcourse, the end of the year brings with it much of Hallyu wave’s best. But this drama, definitely takes the cake. What did you think of the first two episodes? Were the better, or worse, than Descendants of the Sun? Let us know in the comments below!